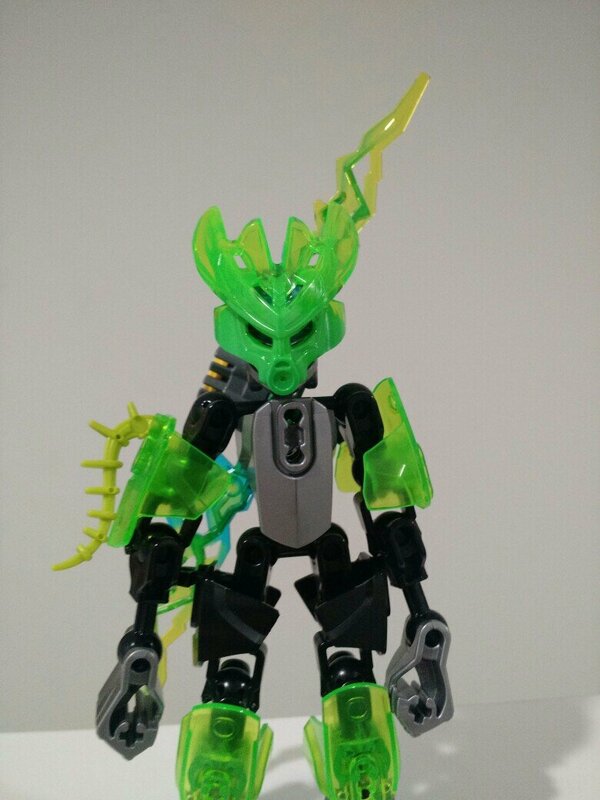 Not even 20 years since the departure of the Toa, Ekimu the Mask Maker, unofficial leader of the island of Okoto, called adventurers from all around the island, all to the City of the Mask Makers, to listen to his plea. That is why you are here; all of you have been called here by him to help recover the island from its recent crises. This RP will involve you, Okotan adventurers, exploring the island of Okoto and the surrounding areas, both canon and not so. although, to do that you're gonna need a character. 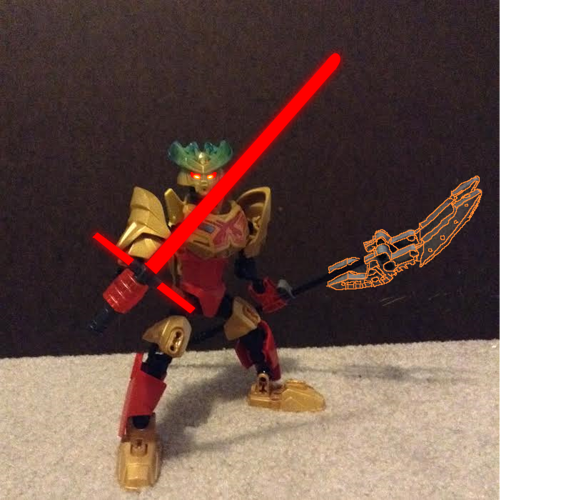 I haven't been in a Bionicle RP yet. Why not. Appearance: Purple mask, silver and black armor, silver shoulder pads. Blue eyes. A bit taller than most Okotans. Personality: Calm but easily angered/annoyed. Bio: Atlas, unlike most Earth Okotans searches for treasure instead of mining crystals. Although he does mine occasionally. Appearance: Dark green with green and trans green highlights, jungle Okotan mask. Bio/Personality: Solemn, lost in thought, Quiet. He would rather be alone, but he will work with others when he needs or chooses to. Bio- Echo came from a village between the water and jungle regions, he abandoned it as a young child and fled to the ice region due to unknown reasons. Personality: She's Lync. You'll catch on pretty quick. I'll actually try and add something here if you want me to. Bio: Lync likes to live on her own, only working with others when darkness menaced the island ten years prior. @jayzor17 @BrokenAxels @Toa_Distraxx @Morgy all accepted. Equipment: grappling hook(not a grappling gun, a grappling hook) a sword within one side of the blade being serrated, a glider made of leaves and sticks. Appearance: green mask, silver armor with black and trans green accents. Bio/Personality: an eccentric inventor/adventure who has wandered the island looking for inspiration for his inventions. Equipment: A sword with enough of a curve on the end to double as an ice pick, buckler shield. Appearance: white mask, trans blue with white and silver accents. Bio/Personality: cold and calculating, hides his emotions. Equipment: a very scimitar like sword, slingshot. Appearance: grey mask, burnt orange body with grey and trans light green accents. Bio/Personality: sarcastic and witty wanderer of the region of stone. Bio: Vladin is an adventurer. He loves to search for tresures along with his twin sister, Athena. His father is Narmoto's best friend, while her mother is a healer from the Region of Water (I don't know what results from two different Okotoans. I think that the child will have one element active, and one inactive). He is a very good engineer and like to make small robots. Appearance: Dark blue mask, dark blue armor, with some purple accents. Bio: Athena is Vladin's twin. She is older than him with five seconds and she loves to go in adventures with him. She always wanted to met a Toa. She is also very very very smart. Thank you! We already have nine characters. Isn't this enough? Weapons/equipment: His weapon and equipment, the ones he always has on him at least, include a scythe with a large, ornate blade with a dragon design on it which he manages to always keep in near pristine condition, holding clips/holsters along his back, which are designed for quick removal. He has also has a shoulder mounted rapid fire plasma/whatever it is they use cannon that can fire 15 shots before a reload is required, two knives with hip holsters, a large, tattered, black cloak, that can cover his entire body, with hood and a side satchel which holds a sharpening stone, a light stone (pretty sure those are in Okoto), flint and steel, a highly compact able sleeping bag. Appearance: He is quite tall, being above average for most Okotorans, even standing over most other above a enrage ones, he is still much shorter than a toa though so one would not mistake him for one. To counter his height though he is quite skinny, while not abnormally he is skinny enough to be considered quite a lanky individual. Despite his appearance he is still quite an intimidating figure, towering above others with clawed hands and feet that make him an exemplary hand to hand combatant and climber, his armour, a shade of black so deep he easily blends in with even the barest of shadows, cracked and scoured from years of fighting and his massive scythe which he keeps on his person at all times. For his build as said he's tall and skinny with clawed hands and feet and pitch black armour. He also has black, semi crystalline formations on his shoulders with translucent green tips, black unity armour on his translucent green upper arms and lower legs, black skeletal lower arms, black armoured, black skeletal lower legs and on his black chest piece he has a black, skeletal rib design. Personality: He is by all definition a loner, a very up unsocial one at that, when he's around others he usually seems very… Blank, barely showing any emotions. he prefers to be left alone and does not usually speak much, typically only doing so when he needs to reply, he's working with others, he needs to ask something important or something/someone interests him to ask about it/speak to them. He also has a tendency to give off a very intimidating aura to others who he isn't used to, making it more difficult for others to approach him. This doesn't mean he's not good with others, it just typically takes him a while to get used to someone enough to open up, and he tends to not have that time or enjoy the others company enough to want to, but if he does he becomes more social with them and his emotions do show through more, he is actually quite a happy person and a bit of a jokester, albeit a bit soft spoken and unsocial. That's not to say he's a pushover or something like that, far from it, angering him is the last thing you want to do, he has been known to nearly kill others who've angered him, flying into a blind rage dependent on how badly the enraged him. He tends to be very apathetic towards others unless he likes them, his apathy is at a level where he could watch someone die and not care, but he will try and help someone in a situation like that but someone like a beggar or hobo he can easily ignore. Due to his tribe he has highly increased strength (for his build. So really just slightly above average). He is also very good at sneaking and such due to his armours coloring, being able to hide in shadows with ease and being quite light on his feet. He is less agile, slower and heavier than expected, also due to his tribe (going with the earth types are heavy thing and can't swim well) but he has learned some parkour and is good at it, mainly just with climbing and jumping slightly larger distances than expected, also he has learned to swim much easier than other earth type Okotorans but still greatly dislikes water. He is not the most well armoured individual but makes up for that in endurance, being able to withstand multiple heavy hits, of course after a fight like that he'll basically be out of commission for quite a bit while he recovers and his stamina isn't the best for certain activities, such as running, tiring out faster than most. Not much is known of Tekans past or his age due to his secluded nature but it is believed he is at least some middle aged or a touch younger (for an Okotoran). God! Your reply is so big! IT'S CALLED COPY, PASTE & EDIT! MUAHAHAHAHA! Accepted, if(and I assume it is) the Avohki is powerless. Also, it’ll be up soon. Element: Primary element is Fire. Equipment: Two Golden Swords and a Lava Surfboard that can be used as a shield. 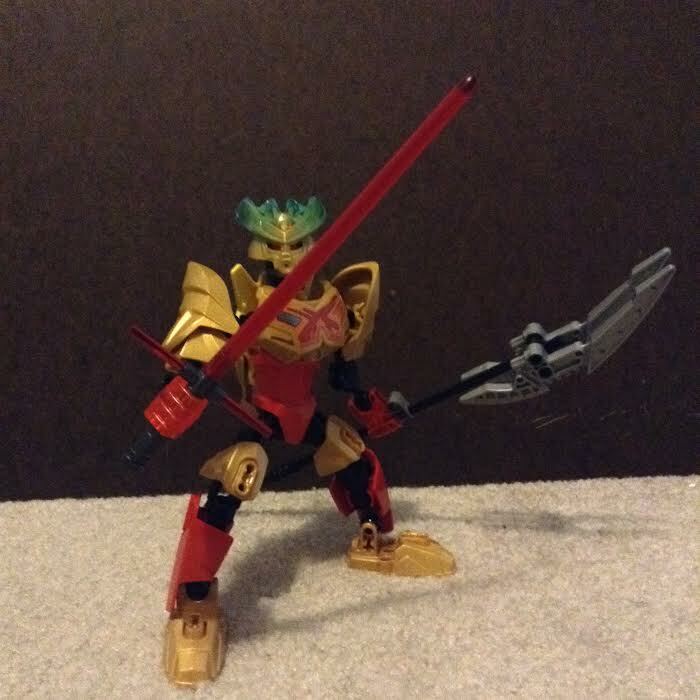 Appearance: Taller than most other Okotans, red eyes, has red and gold armor that is reminiscent of the armor designs of Tahu, the Master of Fire. Has a standard Okotan Mask with a golden color. Bio/Personality: Dreams to one day make masks as an apprentice to Ekimu so he can help others in a greater capacity than he otherwise could. He is friendly but wary of danger and he fancies himself a bit of a strategist. He lives in the City of the Mask Makers and helps out with the defense and construction when needed and enjoys reading in his spare time. He is also a bit of a musician in that he rarely has a moment where a song isn't stuck in his head. (@Runa) What is thine verdict?